Looking to upgrade your living space with the very latest innovations, trends and collections in lighting? Then look no further than Lightovation 2019: Dallas International Lighting Show. As North America’s destination for lighting decision makers—and the premier event for lighting trend-setters and thought-leaders to show off their latest products—it’s among the most important events in the lighting industry. After attending Lightovation, we’ve got the scoop on the distinctive and decidedly stylistic direction lighting design is going in this year. So without further ado, let’s get into it! We think you’ll be pleasantly surprised by this year’s lighting color trends. Think bright and dazzling, but done in a way that’s sophisticated and tasteful. Also, get ready for differing expressive elements you wouldn’t normally expect to see in one fixture, beautifully converging together. Light Blue: Since the 1940s and 50s, blue has been North America’s favorite color, with light blue being a go-to favorite of designers. In 2019, “denim blue” is the new “light blue.” Why? It’s chic and casual, it evokes nature and let’s be honest—denim is just plain cool. Pink: As you may know, one of the more recent iterations of the pink color trend is “Millennial Pink”. Ah, where did it all begin? Was it the color scheme from Wes Anderson’s The Grand Budapest Hotel or was it the “rose gold” iPhone? Either way, this year’s lighting is going in a decidedly more vivid direction. Think a brighter shade of “Millennial Pink”—one that has the visual kick of the inside of a grapefruit. 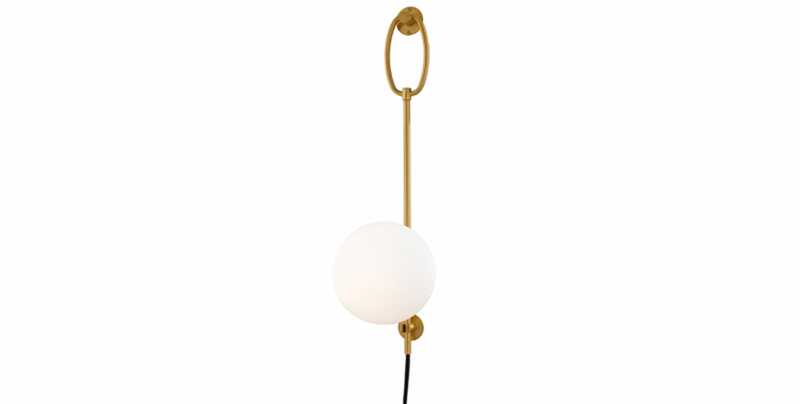 Case in-point: the new Scarlett Pendant by Mitzi - Hudson Valley Lighting. 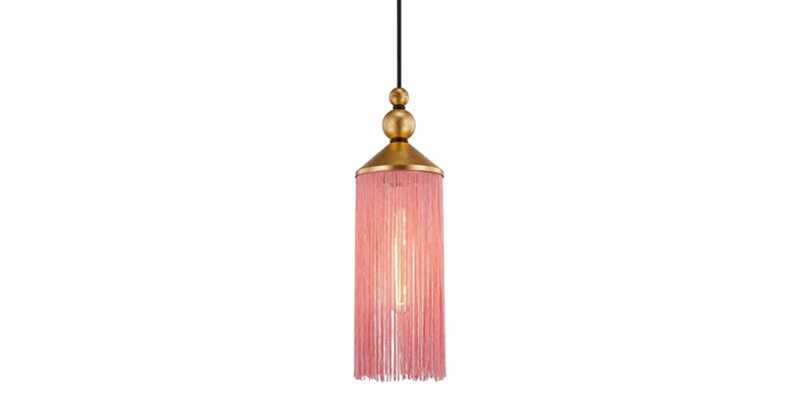 The pink tassels are made with silk and accented with the aged brass-capped top and black cloth cord for a fresh, timeless and oh-so-easy-on-the-eyes design. White and Wood: You love wood. You love an eye-catching finish on metal. Guess what? You don’t have to pick one or the other. In 2019, let some of the new and stunning mixed material fixtures help you to enhance the overall look of your designer space. Mixing materials is a great way to add a modern punch to a traditional one. A great example: glossy white finish paired with a classic wood grain. How can you resist? When it comes to materials in 2019, we think you’ll be pleasantly surprised by what’s new. The general direction most definitely skews toward that which is natural, textural and visually eager to please. Uh, yeah, that sounds like our kind of trend. Plaster: With its crafty look and feel, plaster is quickly becoming one of the biggest lighting design trends of the year. It delivers a unique, informal, visual interest that really pops in a designer atmosphere. Plus, plaster is a look that works great on everything from vintage-inspired sconces to contemporary pendant lights, so take advantage. Concrete: One of the great things about concrete is its ability to take unique shapes and forms with a fluid sense of style. As a result, concrete lighting design is a great way to bring a smooth and naturalistic feel to an interior space. The tactile aesthetic of concrete is definitely one that you’ll want to consider for your home this year. Rattan and Wood: Tuning into nature via design is a significant lighting theme in 2019, and there are few better ways to bring nature into your home than with the elements of rattan and wood. Think about a rattan table lamp to invite that breezy island feel indoors, or a pendant with natural wood grain to infuse an interior space with an outdoorsy vibe. Plus, rattan and wood are two elements that will never go out of style. Take notice of some of the sub-categories in lighting that are taking center stage this year. Why? One, because they are irresistible. And two, because they present an opportunity to really show off your sense of style and do something distinctive with lighting in your home. Portables: They’re easy to install and very often display like a fine piece of artwork. No fuss, no mess. Portable lighting, like plug-in wall sconces, is really making waves in 2019. Portables, such as the Gina Portable Wall Sconce from Mitzi - Hudson Valley Lighting, are particularly great if you’re a renter but still want to invest in the design of your home—you can take it with you when you go. Bath and Vanity: This is one of our favorite new trends—the bath environment as a focal point of the home. If you’re looking to upgrade your bathroom and turn it into a sanctuary, then you’ll love some of the refreshing bath and vanity lights that are gracing showrooms. You’ll find everything from rustic and vintage to contemporary and modern fixtures to kick up your bath style a notch. A number of distinctive lighting themes are taking shape in 2019, particularly in the areas of designer collaborations and customization—two areas we can’t help but get really excited about. Designer Collaborations: More and more, lighting brands are collaborating with interior designers on lighting collections. Why? It’s an opportunity to bring the best of the brand and a fresh creative perspective together. Case-in-point is Corbett Lighting’s collaboration with Hollywood glam-style designer Martyn Lawrence Bullard and Hudson Valley Lighting’s collaboration with new traditional designer Mark D. Sikes. Trust us, there’s nothing quite like having a piece from a leading designer in your home environment. Customization: If you’re like many customers, you want more customization when it comes to lighting your home. Leading-edge lighting brands, like SONNEMAN, have realized this and are making modular systems—lighting than can be broken down into smaller parts or sections for greater flexibility. 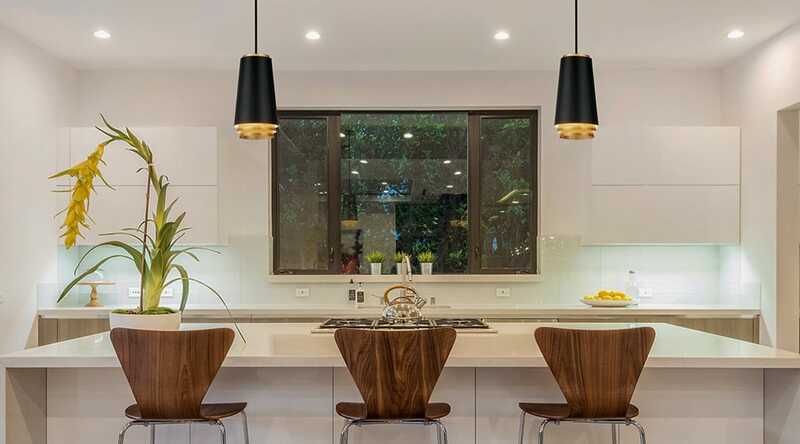 That means you can easily configure lighting specifically to your needs, whether it’s lighting your kitchen island from different angles or creating a highly focused reading area in the corner of your family room. As you can see, 2019 is shaping up to be an incredibly exciting year for lighting that will deliver you no shortage of options to illuminate your home in fresh and inspiring ways. Now that you’re up to speed on some of the latest styles and innovations, you can easily create an environment that is not only trendy and timely, but that will also stand the test of time.